You can carry it to all your formal/not-so-formal quirky events! It would be appropriate to carry it to your co-worker's wedding, or awkward convention dinners, or to see your friends play in their new indie band. It's perfect for first dates, church luncheons, your sister-in-law's baby shower, and your high school reunion! It's also super fun to make! So I was thinking, LET'S HAVE A GIVEAWAY!!!!! This is the yarn and beads that you need to create a Quirky Crochet Handbag of your own!!! But you don't have to buy it and spend $15 of your hard earned cash on it, you can win it for FREE just by taking 30 seconds and VOTING for me!! 2. If you vote a 2nd time (or MORE!!!) on your Smartphone, Tablet, Kindle, Nook, Husband/Co-worker/Best Friend's computer/smartphone, you get another vote! Leave a second comment on this post to let me know you voted again! 3. 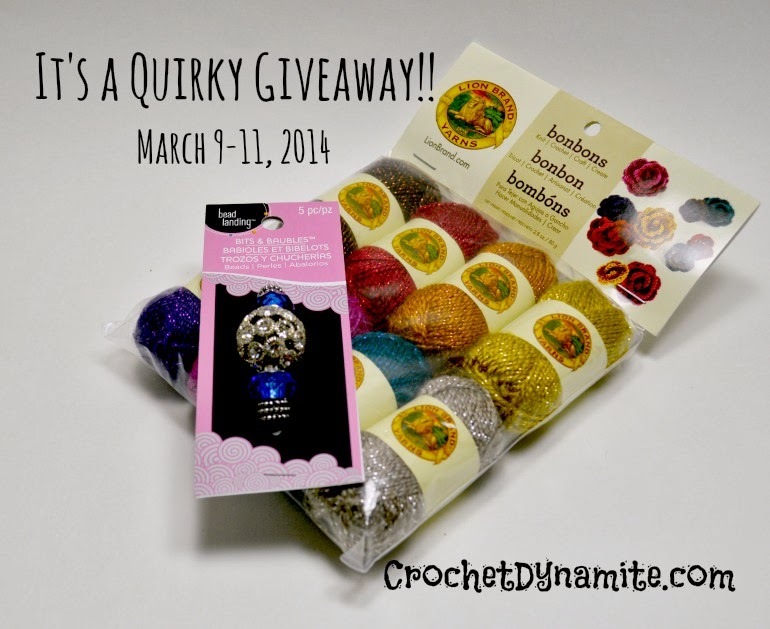 If you'd like to share this giveaway with your friends and family by blogging about it, Tweeting about it, sharing it on Facebook or Google+, or Pinning it to your crafty/crochet board, you can earn a third entry! Leave a third comment on this post to let me know you shared it! Have you VOTED yet? Go do it now, and win yourself an awesome prize!!! Edit 3/12/14: The giveaway has ended! Thank you to everyone who voted and entered! That's why I love you so much, Nyan!!! xo!! I voted! Love the look of the bag. Voted once at the site. The bag looks great! Love your blog, and I voted twice. Thank you! 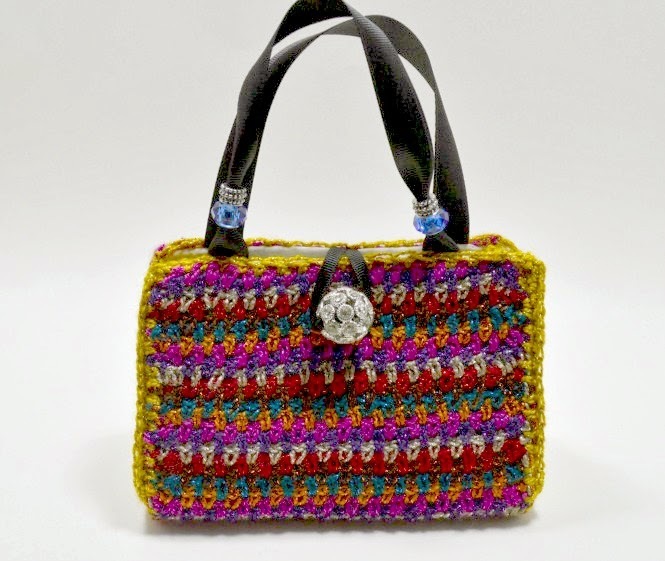 Voted for your quirky crochet bag, that I love! ccostlY@gmail.com, Thank you! I voted for this cute handbag, not just because I'd like to win your prize but because it is the best project! I voted cos your bag is by far the best project there IMO. I think you've put in twice the time of the others, if not 10 or 20 times, and it shows! I voted on FavCrafts site. thanks for the giveaway! I voted for your handbag.....LOVE IT! Love that lil" bag!! I voted once. My email address is: Raggz2Baggz@gmail.com. Is there a pattern coming? Thank you!! xo!! I hope you do make it! The pattern is actually on the FaveCrafts site where you voted. If you click on the name of the bag it should pop right up! I voted after you first posted earlier last week. I LOVE this project! And I've voted three times so far. (I opened a different browser each time - once on Internet Explorer, once on Chrome, and once on Waterfox.) And that's just at work! LOL I'll vote again when I get home! Plus, I've shared it on facebook. You go, girlie!! Thank you so much Chris!! xo!! I voted for your design bag! I love it! And I voted for you again! I've now voted twice for you (KMater325@gmail.com), and I have to say out of all the choices, your purse is leaps ahead of the others! I voted too! :) Cute bag! Thanks for the chance to win! I have voted and shared it on my fbpage, Erika Drewke. I voted from my computer. Cute bag! You should definitely win. I also voted from my iphone. And then I voted again from Mum's computer! You are too cute, please tell your mum thank you!! xo!! Then I shared it on Facebook. I hope you win. Your project was my favorite. Stephanie, you are a rockstar!!! Thank you so much!! xo!! The voting has closed for this giveaway. Thank you so much for all of your support and love!!!! xoxo!! !